In a well-attended ceremony on December 29, 2001, the KCL Champions Trophy and various other individual prizes were presented. The ceremony was held at an Indian restaurant at Roppongi, the well-known entertainment district of Tokyo and was attended by more than 50 guests. The winner’s trophy was presented to the Tokyo Giants captain Mumtaz Alam by Kei Imamura, the KCL Treasurer. The Runners-Up trophy was presented to Aamir Ali, the captain of the losing finalist. 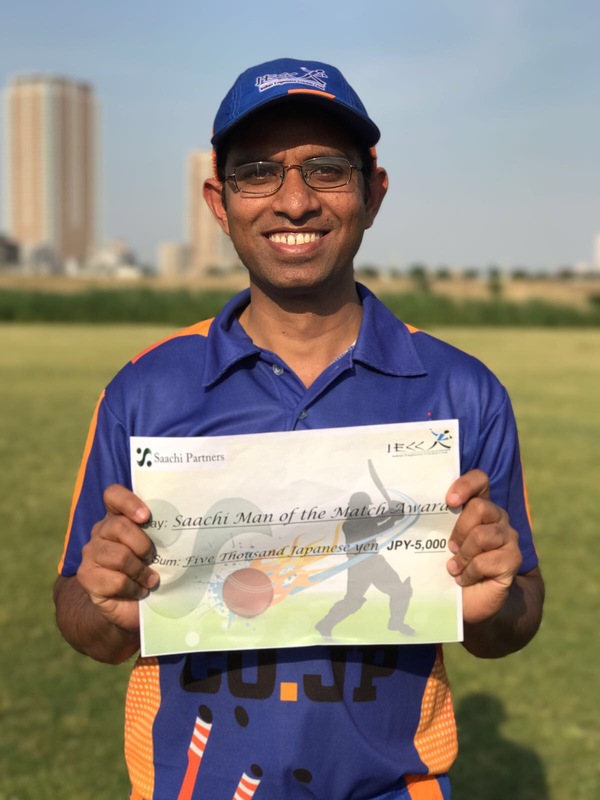 Man of the Match of the final was awarded to Tauseef Ahmed of Tokyo Giants for his match haul of 4 wickets in 9 balls conceding only 3 wickets, thus turning the match in their favour. Other individual prizes are given below. For these prizes, performances of only the league level matches were considered to apply a uniform yardstick for analysis. Best bowler of the league – Naeem Qureshi of Friends XI for his 13 wickets, the highest in the league. 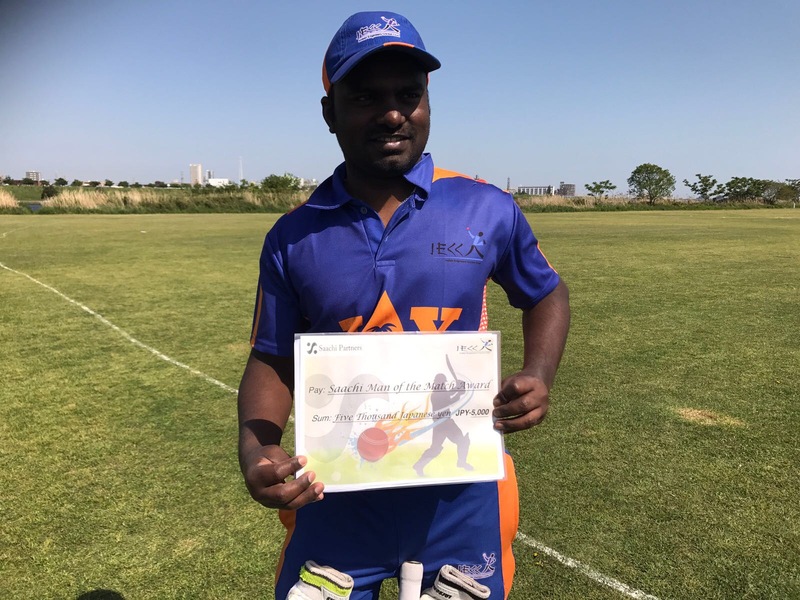 M.V.P of the league – Mumtaz Alam of Tokyo Giants for his 214 runs, three 50s and 6 wickets. In a fine gesture, the Tokyo Giants, on their own, presented trophies to three best Japanese players of the league. The recipients of this unique prizes were 1)Hirayama of MAX C.C. for most runs 118 in 5 innings, 59 being his highest, 2)Kawashima of Fuji Far East C.C. for his 98 runs and 7 catches as a Wicket Keeper and 3)Kojima of Wyverns C.C. for his 11 wickets, 4 for 7 being his best. The Japan cricket Association(JCA) has drawn up plans to introduce an inter-region competition, which has been a major hurdle for the integration of cricket in various regions of the country, from 2002 season. The division of the just concluded Kanto cricket League(KCL) into two groups was part of this initiative. 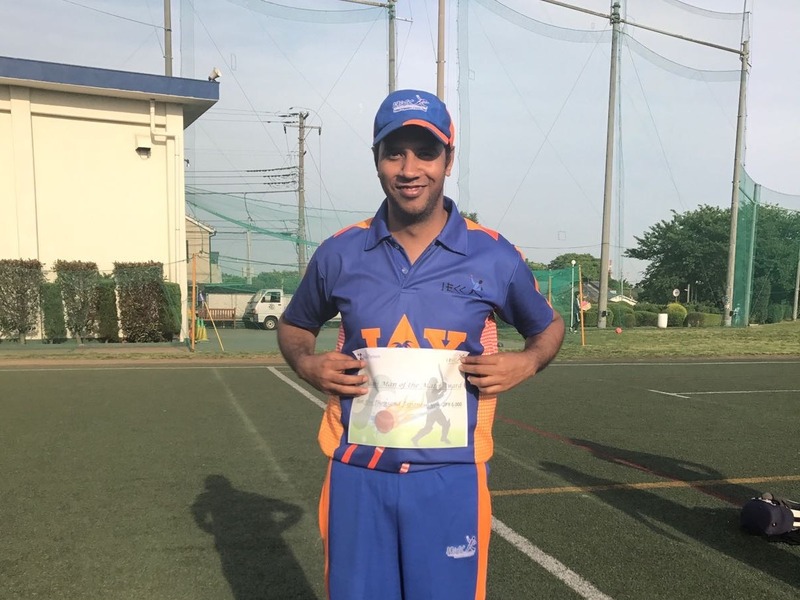 As a prelude to the full match inter-region competition, the JCA organised a Sixes(Six-a-side, Five overs) tournament in the scenic resort of Nihon Aerobics Center in Chiba, in the outskirts of Tokyo with teams from various regions participating. The two-day event was jointly sponsored by various embassies of cricket playing nations and by the JCA. The first day, Nov. 23rd, saw the round robin matches and the finals were played on the second day(Nov 24th) with Tokai taking the Cup home comfortably. Bowl Final: Kansai – 49 in 5 overs(Orita 2 for 6), Tohoku & Kita Kanto – 50 in 4.4 overs. 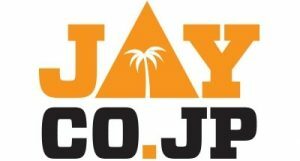 Plate Final: Kyushu – 43 in 5 overs, Minami Kanto – 45 in 2.4 overs. Cup Final: Tokai – 72 in 5 overs, Minami Kanto B – 43 in 5 overs. So, Tokai took the cup home. But, thanks to some great organizing efforts by the JCA, the umpires, the players and the spectators, Cricket won that day. Everyone departed from the event with great hopes for the future of Cricket in Japan. Perhaps, we all saw history in the making! We all look forward to bigger things, some CRICKET EXTRAVAGANZA in the near future in Japan. Detailed report of each match on both days can be found here. 1. What is the connection between Indian fast bowler of yester years, Amar Singh and Mahatma Gandhi? 2. Cricket was the most important part of life of Monty Nolle – early 20th century Australian cricketer. What did he famously do when he was once denied permission to play inter-state cricket for New South Wales? The Western Australian CA has been confirmed as host of the inaugural ICC East Asia Cricket Eights Festival from 25 February to 1 March next year. Competing at the event, which compliments the global ICC objective of widening the market by promoting and expanding the game in a variety of forms, will be: Indonesia (new ICC Affiliate member in 2001); Japan (ICC Affiliate member since 1989); Philippines (ICC Affiliate member since 2000); South Korea (new ICC Affiliate member in 2001), and an; ACB/Australian Indigenous development team. Matches will be played on WACA Grade grounds throughout Perth. So improve your cricket during this winter break and be ready for the KCL 2002 and get that elusive Best Batsman/MoM/MVP of the league trophy. 2. He changed his profession. He was working in a bank and gave up his earlier profession to train as dentist.